I love my San Francisco Giants. During the good and bad times, the warm days at AT&T Park and freezing cold days at Candlestick, and from the nosebleeds to the premium seats that had me on TV all day long, I've always been a loyal fan. At AT&T Park, there's always new developments and innovations that makes our ballpark stand out as one of the best in the nation. But there's always room for improvement. Every time we win the game, do they always have to play the "whoo hoo" song? Isn't there a more recent trendy song that can get the crowd going? Remember "Who Let the Dogs Out?" It was great to hear that and hear the fans in the stands sing out loud. Could we sing the Ghostbusters song when Posey hits a home run? The Giants promotes all these new food options like the Original Joes burgers and sushi, but these new creations are only sold in just one isolated location in the entire park. Original Joes burgers are only sold near section 136 near the mini ballpark for kids, and the sushi stand is in the Club Level which means only the privileged Giants fans have access. At least open a second stand somewhere accessible to everyone. Where's the social media hangout they planned to open at the former Build a Bear stand? Now it's an abandoned building for the last few homestands. If you don't plan to open a social media hangout, how about opening a second Crazy Crabz location because those sandwiches tastes GOOD! Sometimes the ushers don't really care about people going to their seats while the ball is in play or the batter is in the box. It annoys the crap out of me seeing people just walk up the stairs to their seats and blocking the view of the ball being pitched. I remember the when the arcade section had the flat penny machine and the penny you received said what game you attended. It was the best souvenir for just 51 cents. Can we get that back? Can you cook the garlic fries a little bit longer? The Club level has a reputation for cooking good garlic fries, but the rest of the stands in the park could use a little more TLC. 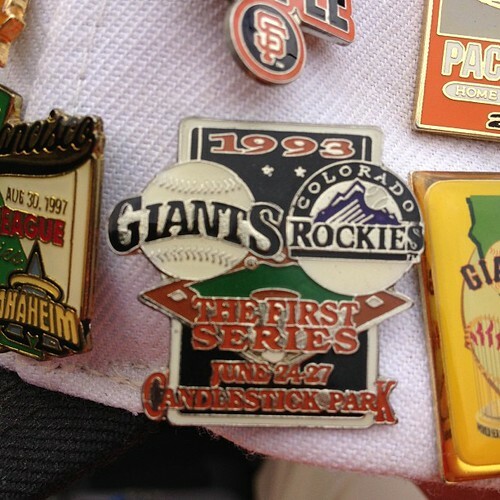 Bring back the souvenir pin giveaways. 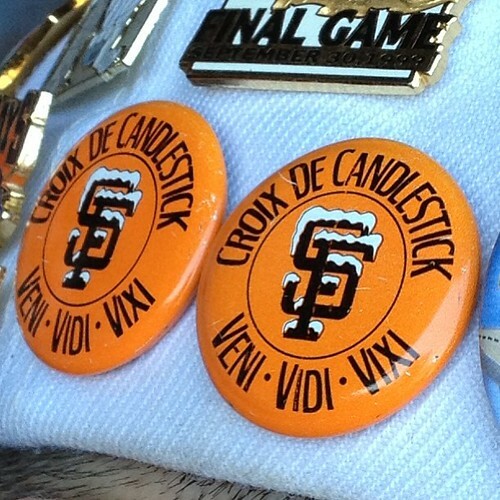 It used to be a common occurrence back at Candlestick, including one pin I still have on my hat from nearly 20 years ago when the Rockies first played against the Giants at Candlestick. I like the pins more than a box full of giveaway hats and oddball items like fingerless gloves. I find it ironic that soda cans are banned from bring brought into the park, but they sell beer in aluminum bottles. Are aluminum beverage containers considered a weapon? Please kill-off the "Family Feud" from your gameshow inning promotion. How the hell is Dirty Harry not a top eight choice for best San Francisco movie, but that Nicholas Cage film, The Rock is a top eight? Is it just me or is nearly impossible to find the designated driver program booth anymore? Ever since they yanked-out the desk next to Guest Services, there's no way to tell if they even take sign-ups anymore for those free sodas. They put a new location on the promenade level near the stairwell leading to the Lefty O'Doul gate, but it's manned only on a few days and you'd miss it if you weren't looking carefully. "Can you cook the garlic fries a little bit longer? The Club level has a reputation for cooking good garlic fries, but the rest of the stands in the park could use a little more TLC." What next? The caviar's too salty? Come to Chicago, and spend a week at Wrigley Field. Brutally awful baseball, terrible food, a dumpy, falling-apart ballpark, and the worst beer EVER. Very expensive, too. You'll never fuss about the garlic fries again!